During his days as Harvard's influential president, Charles W. Eliot made a frequent assertion: If you were to spend just 15 minutes a day reading the right books, a quantity that could fit on a five foot shelf, you could give yourself a proper liberal education. The publisher P. F. Collier and Son loved the idea and asked Eliot to assemble the right collection of works. The result wasa 51-volume series published in 1909 called Dr. Eliot's Five Foot Shelf. Later it would simply be called The Harvard Classics. You can still buy an old set off of eBay for $399. But, just as easily, you can head to the Internet Archive and Project Gutenberg, which have centralized links to every text included in The Harvard Classics (Wealth of Nations, Origin of Species, Plutarch's Lives, the list goes on below). Please note that the previous two links won't give you access to the actual annotated Harvard Classics texts edited by Eliot himself. But if you want just that, you can always click here and get digital scans of the true Harvard Classics. Please note that the first two volumes appear at the bottom of the page. And, in case you want to deepen your liberal education yet further, don't forget to check out our collection 1,300 Free Online Courses from Top Universities. Also spend some time with these other resources: 800 Free eBooks for iPad, Kindle & Other Devices and 1,000 Free Audio Books: Download Great Books for Free. The last volume contains sixty lectures introducing and summarizing the covered fields: history, poetry, natural science, philosophy, biography, prose fiction, criticism and the essay, education, political science, drama, travelogues, and religion. The Harvard Classics are also available on Bartleby in html format, together with Eliot’s annotations. I have this set of book!! It was given to me when I graduated high school. I so love them – esp. because some of them recently got wet because of a leakage. I now also love the fact that they’re available online? Oh wow, I know what I’ll be doing this summer. The century-old books, digitized by Internet Archive, are a pleasure to leaf through in this new incarnation. Thousands of years of thoughts of the foremost witnesses and creators of our cultures are ours to think again. Maybe with their help we can see our today as well as they could theirs. How can you get credit for the free online courses? I am 65 and interested in taking some later. I think your site is incredible. I’m telling all my friends about it. And for those who want a bit of formal training in reading these books, while still retaining the “raw” feel of reading the books and not listening to academic lectures about them, there are still a small handful of colleges that offer BAs based simply upon reading and discussing these books with peer readers. St. John’s College in Annapolis and Santa Fe, Thomas Aquinas College in California both provide such an education as their only “major”. And even core programs at Chicago, Notre Dame, and Columbia (I think) still might provide and education in these “Great Books”. I have the eBook versions–and the very edition pictured on top! I AM PERSUING FIVE FREE ONLINE COURSES FROM THIS SITE.ELIOT COLLECTION IS A GEM TO CHERRISH FOR GENERATIONS TO COME. I have a complete set of The Harvard Classics, copyright 1909, all 50 volumes, which I will sell to you if you are interested. If so, contact me at the above email address, or call me at 228-224-1940. U of Chicago’s great books program is a certificate, not a bachelor’s degree. 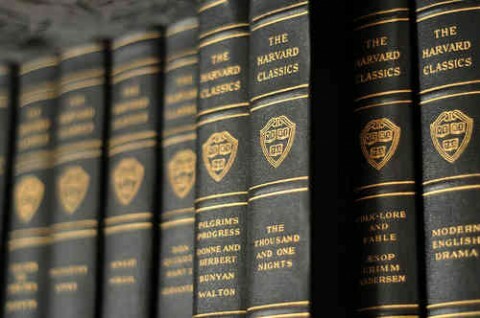 I’m no Harvard Scholar but I don’t see any links to the Harvard Classics. Aww, you can’t download them onto your phone? I didn’t see a link to download them all at once. It seems that I have to download them one at a time. I don’t have a week to spare for downloading books, so I bought the entire download (180 books) via Amazon for $2.69; delivered both to my Kindle and my Kindle Fire HD.